This Skandika model seems to be out to prove that water-based resistance is not limited to one brand. Here we have a water tank, adjustable resistance settings and other features in a more high-tech looking model. 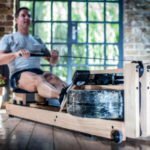 Is this the affordable, accessible alternative to the WaterRower that consumers have been looking for? What benefits have been highlighted in reviews for this Skandika water-resistance Rower? 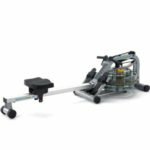 There is the sense from the specification that this is a more high tech version of the Water Rower, with more features and options to play with. 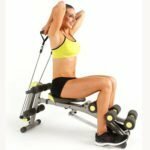 There are users claiming that the performance and workout offered by this model is comparable to that of the WaterRower, have tried the latter at a previous point. There is a simple dial on the 17 litre tank to adjust the resistance and maintain a fluid motion. Other positive comments for this machine relate to the ease of assembly and general construction. There is some work to do to get it set up, but nothing especially difficult. Some say that it is up and running in around 30 to 40 minutes. The biggest concern here seems to be in making sure that users don’t over-fill the water tank. The machine is slim, pretty sturdy in use, can be stored upright when not in use and also has transport wheels. There are also some interesting comments about the extra touches included with the package, such as the water treatment discs, foot straps and the paint for touching up any damage to the paintwork. 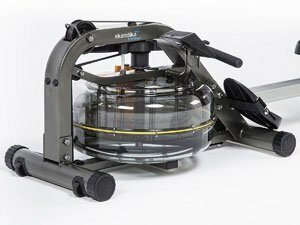 Are there any downsides to this Skandika Nemo Aqua Liquid Rowing Machine that prospective owners should know about? Negative comments are minimal with this machine. There are some complaints about the quality of the LCD display and data offered. It provides stroke counts and time elapsed, but no clear figures on distance and speed. This could be a problem for those new to rowing that are aiming for distance-based goals. In fact, the console itself it pretty small and basic with minimal settings. The appeal here depends upon your aims and how much you want the machine to do for you. Summary: does this mean that the Skandika Nemo is still recommendable? This is not the WaterRower, and no amount of extra paint or stylish features will compete with this brand on the aesthetic front. However, this machine does appear to offer a workout and experience that is comparable. Users are still able to enjoy the sensation of the water resistance on a well-built, user-friendly machine. It also retains many of the benefits buyers are after, including storage capabilities. 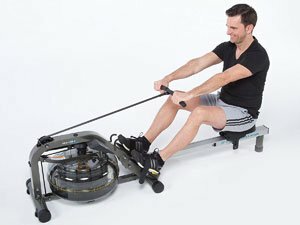 As a result, the Skandika rowing machine really does seems to be a great, affordable alternative for those that want to save a little money on a liquid-based rowing experience.